"Oh, the inner turmoil when one moment I was on my knees compassionately praying for my neighbor, and the next moment I wanted to strangle her and kick her ugly dog." It startled me! It made me laugh out loud... And then I thought "How does she know me?" Page after page she was writing my story. I couldn't put it down. I couldn't believe what I was reading. She knows exactly how I feel and what I'm going through. So that must mean... I'm not the only one! Before I read this book, I would have never related my feelings to hormones. I thought I was just a weak woman. I couldn't figure out why I couldn't get it all together. Now I know. Hormones. How do I manage the swing between feeling super confident and energetic one day, and incompetent and listless the next? How do I handle my self-hatred after downing an extra large bag of peanut M & M's the day before my period. 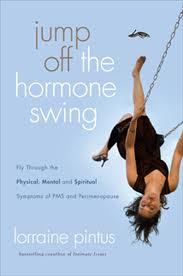 Unlike a medical book, Jump Off the Hormone Swing addresses EVERY aspect of PMS. Physical, Mental (Mood), and Spiritual. She gives a very simplified explanation of what part each hormone plays in your body... the effects of too little, or too much. Lorraine gives advice on diet and exercise, relieving stress, planning ahead for the days that you know will be the hardest for you (Who would have thought? ), and most of all... she reminds us to invite God into these issues as well. Lorraine shares from her heart and a Biblical perspective. She shares many of her personal 'aha' moments with us. She shows us how to 'do' life... how to be a Godly woman even in the middle of a hormonal storm. You will also find a 10-week Bible Study in the back of the book, along with a symptom tracker. There is so much in this book I'd like to share that I can't recommend it highly enough. *I received a copy of this book from Moody Publishers in exchange for my honest review. ~Thank you! You can also check out Lorraine's website here. A lot of great information there as well.